Philadelphia has a special connection to the 18th century, and with good reason. After all, during the 1700s Philadelphia was home to Franklin, Jefferson, Washington and Adams, it was the birthplace of America, and it served as the federal capital. Since that golden century, Philadelphia has repeatedly taken its important role in American history and mythologized, commercialized and repackaged it. In 1965, while Ed Bacon was busy refashioning Society Hill, that urge to capitalize on the city’s past took the form of a complex called “Philadelphia 1700,” see the two views below, built off Delaware Avenue, one block north of Spring Garden Street, on Pier 37 and owned by Alfred M. Johnson. 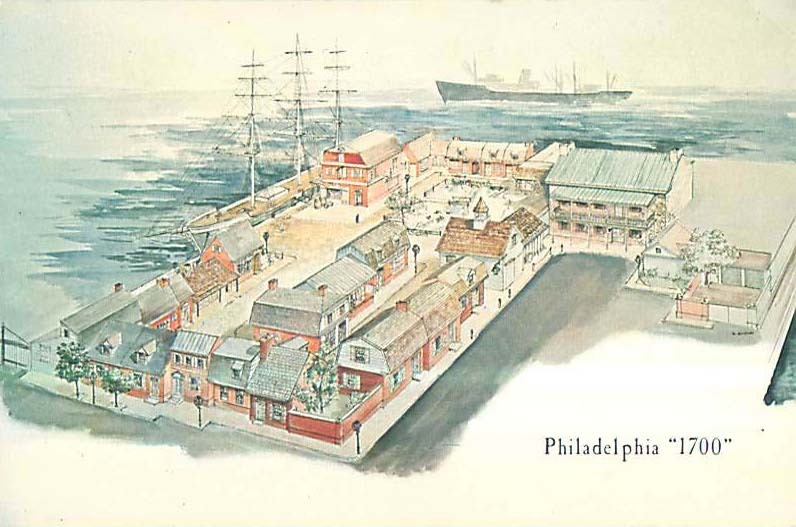 Visit this delightful re-creation of Philadelphia’s colonial seaport. Dine and shop amid the surroundings of an earlier day. Seafood and steaks served in a true maritime surrounding. 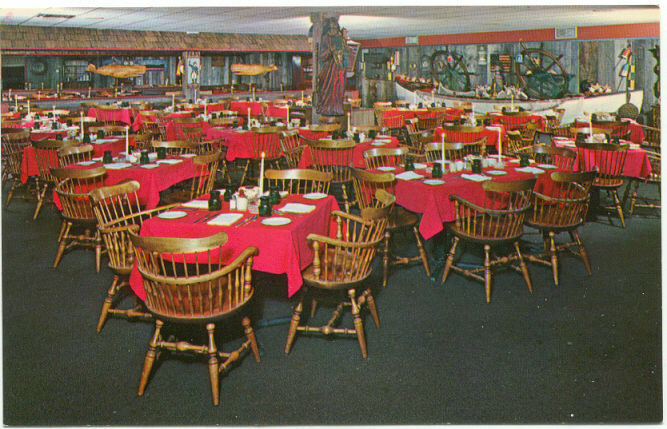 The “true maritime surrounding,” below, included bright red tablecloths, wall to wall carpeting, spindle backed captains chairs and a buffet served from a lifeboat. 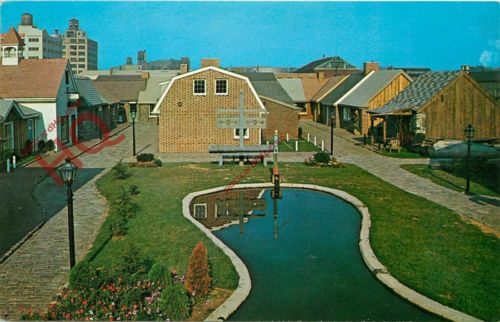 The rest of the complex was made up of various “shoppes” and businesses, including a blacksmith, a candle-maker a baker and a small tobacco shop. In 1965, that particular shop gained notoriety when the owner, Stephen Weinstein, was involved in the gristly murder of a male customer who inflamed him to an “irresistible sexual impulse,” by wearing tight fitting Levi’s. 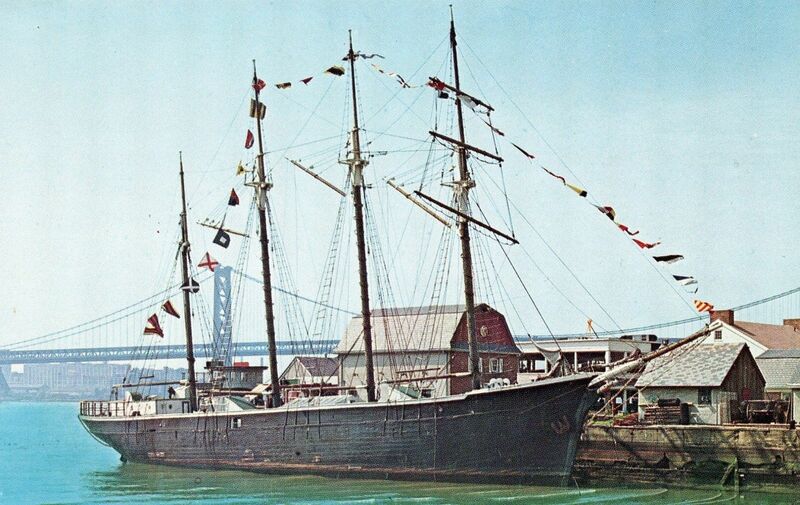 To complete the old timey atmosphere, a four-masted early 20th century Swedish schooner, “The Sonja,” above, was docked on the north side of the pier. The Sonja served as a floating cocktail lounge. It sat in the dock for a few years after the 1700 complex closed, forlorn and abandoned. In 1975 it was damaged by fire and later that year was struck by a freighter and heavily damaged to the point where it could no longer be restored. The Philadelphia “1700” complex lasted about 6 years, closing down some time in 1971. In 1972, the pier became home to the 520 seat Riverfront Restaurant & Dinner Theatre, left, and The Admiral’s Club, a private dining facility. Both were owned and operated by the Tabas family, who had a dominant interest in Royal Bank and ran the Downingtown Inn and Twelve Caesars on City Line Avenue. There’s a great web page about a production of Guys and Dolls presented there in 1978-9: http://www.actorr.com/guysand.htm. The last curtain rang down at the Riverfront Restaurant in 1993, after a dinner show production of the musical revue “Ain’t Misbehavin’.” For the next 10 years, the site remained largely unused. Except for a few postcard images, all traces of Philadelphia “1700” are gone. Please do let me know if you’ve been to Philadelphia “1700” complex, or if you know anything more about it. 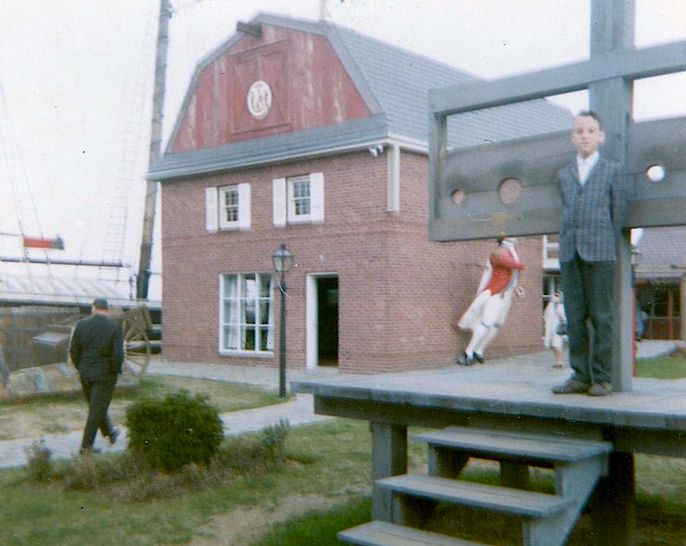 Many thanks to reader Eric Staudt, who very kindly shared this picture, below, of himself standing on the stocks at Philadelphia “1700” in 1966. 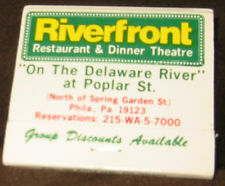 I remember the Riverfront Dinner Theater – I attended a few productions. I don’t remember the ‘1700 complex’ – I think I then remember the Adams Mens Clothing Warehouse moved into one of the large buildings. Thanks, Elizabeth. I’ll have to check into that! My family went to this restaurant to celebrate special occasions. I have a photo which was taken by the “in house” photographer. I was approximately 7 yrs old. I can share this photo with you…not sure how to share on this site. Great Site; yes I visited this place a lot as a kid. Must have been an easy drive for my father to make the trip ; ). I have a picture of me in the “stocks”. It’s crazy but that fellow who turned out to be a murderer, tried to sell cheap pictures to my brother-in-law. After the trials, we use to kid him about that…it was a sad situation. Not sure what “killed” this place, but that had something to do with it. Brandi’s Warf, the restaurant there at the time, had some “high” prices, of course my family was not rich, so we sought out a cheaper places to eat. I was thinking that HPI could have used a place like that, but certainly Franklin Square is in a better centrally located area. Thanks so much for sharing all that, Eric. As I read the sordid murder story I, too, wondered if that contributed to the demise of the complex. Bob; I can scan the photo to you. If interested. Give me the address to send it. Thanks so much, Eric! I’ll email you. I was in the Navy during the Fall of 1965. As a history buff and pipe smoker I found 1700 and Stevie’s pipe shop. A Navy friend and fellow pipe smoker and I bought tobacco and other things there. I purchased a special meerschaum pipe with an amber stem there. I learned about the crime long after I had departed Philly from an article in Time magazine. I still have the pipe. I thought you would get a kick out of this! My Mother worked at the bakery at Philadelphia 1700 until the front of the pier collated and they rebuilt the restaurant over the bakery and pond. We then bought the candy shop “The Treasure Chest of candy”. I was about 9 years old when Mom started there and we were there until the fire and they no longer wanted the shops. All of that time they had this announcement below piped into the shops about every hour or two. I had heard it so many times I memorized it then to the point where when the maître d’s would misplace the card they read for I would be called to the office to recite it to the secretary. That place and this announcement and all the good times my family and I had there will always be embedded in my mind. I’m 59 years old now and can still recite this like it was yesterday. Not bad for an old guy “you think” ? Take care and hope you always had a good time there too!! Good evening and welcome to Philadelphia 1700. Thanks to both of you for sharing your memories. It adds so much to the story! Just found this site after searching for quite a while. My husband and I are cleaning out and came across a photo taken by the photographer at the 1700 Restaurant when we were celebrating my 21st Birthday. It brought back such wonderful memories of a lovely evening. I was so happy to find the site and read what happened to the complex. What a shame that it only lasted a few years! Helen, thanks so much for sharing that memory! Thanks Keith. We also remember well the Inn of the Four Falls……such great memories. What a flood of memories came pouring in when I came across “Philadelphia 1700” on a FB post! 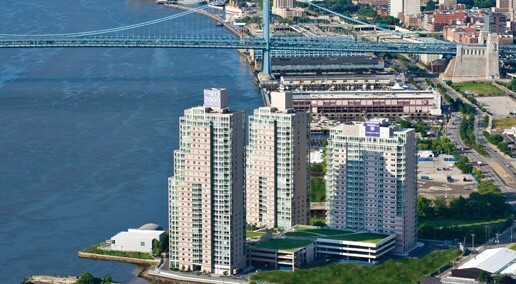 I vividly recall as a mischeivous lad of 12 riding my bike with my pals from Second street all the way up Delaware avenue to this Brigadoon like village on the waterfront! It was authentic yet enigmatic in its extreme isolation. Even then I was in awe of its pseudo colonial appearance which reminded me of the old Lit Brothers Colonial Enchanted Village display at 8th & Market! It is comforting to know that others of my generation still recall this now fading memory of Phillys early 1960s renaissance period! Living in Fishtown as a young kid in the 1960’s, me and my friends would find our way along the river…starting at Penn Treaty Park and heading south toward the Ben Franklin Bridge…we would stop at the different piers, “investigate” and then move on. When we found the 1700, we had a great time just wandering around the little village. I can remember buying candy in the “shoppe” and actually going onto the old pirate ship as my friends and I called it, having a great time. I mention this occasionally to people and they look at me funny, as if I am exaggerating or dreaming of 1700. I was there, and can say I still think about it when I travel along Delaware Avenue these days. Nothing remains from the 1960’s or 70’s and things are changing everyday. Kid’s today do not have the wandering spirit like we di in the 60’s. From selling pretzels to shining shoes, we did it all and saw many great things that used to be. Great Memories. Thanks for sharing those memories, Jim! I’m writing in response to your article on Philadelphia 1700 and Riverfront restaurant and dinner theater . My father Frank Pitocchelli was the treasurer of Philadelphia 1700 and was one of the partners with Fred Johnston of the original restaurant. Fred was a restaurant genius with many re-creations including the sister restaurant the Boston 1800 in Boston’s waterfront. The Sonja was a four masted schooner that Fred Johnston researched found had sunk in the Atlantic and had it dredged up and repaired prior to docking it at Philadelphia 1700. Our family took the Sonya’s final journey from the 1700 underneath the Ben Franklin Bridge and back to its docking space next to the 1700. While in college for hospitality management I had the fortune to work at riverfront restaurant and dinner theater as a bartender and relive some Great childhood memories. 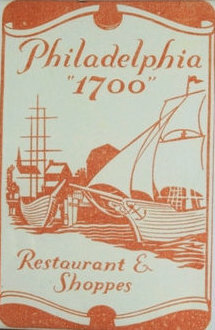 Philadelphia 1700 endured several floods due to the rising Delaware river which is when my father seeked to be brought out of the restaurant and luckily merged the four major losses hit . Thanks so much, John. Personal stories like yours add so much to the narrative. I appreciate your sharing all of that information with me. My friend’s father ran the candle shop there. We used to “work” there, mostly on weekends and during the summer. We snuck into the birthday party that Arthur Godfrey threw for Debbie Reynolds in the restaurant. The candle shop was directly across from Weinstein’s tobacco shop. There was also a “blacksmiths” shop that did metal sculptures. I think there was also a glass shop and a flower shop ( mostly fake flowers). Ron, thanks so much for sharing those memories! I remember going there on Sunday nights because it was the only thing open. My brother and I loved going there to a gift shop that sold little metal cannons that came in a little box . Thanks for jarring my memory. Bob; thanks so much for getting this started. The stories are great! So happy to find this article today! I Appreciate all who wrote and contributed.The Village was very much a part of my life in my older teen years.I loved all the shops.Once My office had a luncheon there for a contest that I was in.(Bell). I love all colonial things,and followed that decor theme my whole life. I also have a few pics which I will share one day,when I locate them.Also I was lucky enough to find a post card of the place in an antique place.I have some reproduction glass bottles I bought there back then. Never heard of the murder.Always wondered why they closed .It was truly a lovely quaint place and sure wish it was still there today!Feel free to message me if anyone has memories there also. Thanks! Karen, many thanks for sharing your memories of Philadelphia 1700, they add s much to the story. I’ve seen postcards and matchbooks from there on eBay from time to time.